We recently witnessed some major transformations done by Google to the Google Play Store that may drive a higher number of quality users (i.e active users with better retention) to install the apps that take advantage of the above changes. 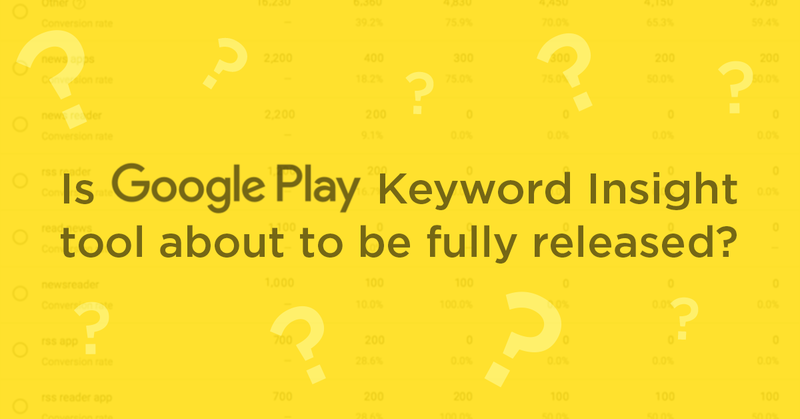 What is The Google Play Keyword Insight Tool? Apart from the major Google Play Store makeover, Google has also been beta testing a groundbreaking keyword insight tool on its Google Play Developer Console. This tool provides developers unprecedented insights into users’ search behavior that can result in better monetization. 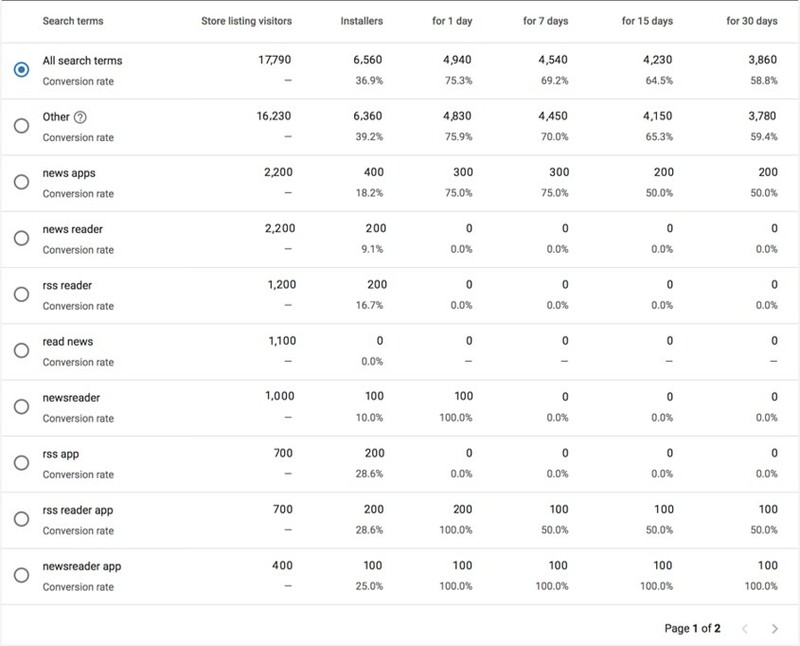 In addition to categorizing organic traffic by ‘Search’ and ‘Browse’ (similar to iTunes Connect), the keyword tool provides a list of the top 1000 search terms for which the app is ranking, as well as the number of Store Listing Visitors, Installs, Conversion Rates, and Retention Rates attributed to each individual search term. The beta, that has been so far visible only to very few developers, has recently become completely unavailable on the Play Console. This may indicate that the feature is soon to be released for all developers. If that is the case, developers and ASO practitioners should pay close attention. This tool might present a major change in conducting keyword optimization once it’s widely released. We had a chance to explore the tool over the past few months as some of our partnering developers participated in the Beta trial. Here are some insights. We measured the value we got from accessing up to 1000 search terms shown via this feature and compared them to the rest of the search terms, which were hidden and displayed as “Other” in the Console. In most cases, the 1000 search terms (displaying data), accounted for more (at times significantly more) than 50% of the page views received each month, resulting in ~40% of monthly installs. Analyzing the list of search terms visible to us and the conversion rate attributed to each one, we were able to determine that there’s a strong correlation between the relevancy of the search term and the likelihood of a user to install the app and retain it for a longer period of time. By targeting keywords not only with high traffic, but also with high conversion, we can improve the precision of our keyword targeting. As implied, brand-related search terms – essentially, being very specific – showed some of the highest conversion rates. This should be considered when targeting competitors. Of course, be very careful if part of your ASO strategy is targeting competitors, as mentioning other brands in your description without permission is absolutely prohibited. While being ranked highly for the most competitive keywords holds great value, many of the top converting search terms were actually long-tails. They might carry less traffic, but being less competitive they also hold more opportunities for strong ranking positions. Moreover, users who search for long-tailed queries are generally looking for something specific, thus downloads from these searches usually result in better conversion and retention rates. It would be extremely valuable to be able to use this tool for the long term. But for the purpose of truly helping all developers capitalize on the recent changes, Google should eliminate the “Others” category, showing the full list of search terms. Additionally, breaking the data down by country – an option that is currently unavailable – would allow ASO specialists to measure the impact of store listing localization. So, stay tuned for further developments. We suspect we haven’t yet seen the last of this tool.